Discussion in 'Hewlett Packard HP InkJet Printers' started by ccc, Nov 19, 2018. Has anyone direct knowledge of using pigment in an HP wide format? There are many HP wide printers with three colors and black (Design Jet 500 series and T120 as well as others.). The black is pigment and the colors are dye. My T120 is a fairly new design and can easily go beyond the plan and drawing capabilities of these machines. On glossy or satin stock at max resolution it produces excellent color prints. How useful it would be if you could run pigment colors as well as black. I know the risks, but here and there I've heard whispers of people doing it. It sees to me that if anyone is, they are likely to be "Printer Knowledge" members. Also, hi to everyone, this is my first post on this amazing site. I'm doing that on Epson printers - running pigment instead of dye inks on some models - it works. I'm not familiar with HP printers, the first question would be whether compatible pigment inks for their thermal printheads are available as refill inks. demoeb and The Hat like this. As long as I know, there is essentially two dominant technology in the way printer prints. Epson uses piezoelectric print heads. Canon and HP use thermal print heads. First we must bear in mind that pigmented inks are composed of tiny solid particles (the pigment). Dye-based inks are composed exclusively of liquids. For printheads designed for piezoelectric technology, read Epson, in principle, swapping inks does not cause major issues. If the swapping is well planned, and using high quality pigment inks. However, for printers that make usage of thermal technology, read Canon and HP, the thing is quite different. Due to the thermal process, there may be unplanned dilations between the two solid elements, the pigment of the inks and the printheads, therefore not dimensioned for it. This may cause irreparable clogging, and permanent damage to the printhead. My advice to anyone using HP and Canon printers is that do not replace dye-based inks with pigmented inks. Not worth the risk. In the case of Epson the risk is acceptable. But keep in mind that a good quality 3rd party pigment inks usually costs the double price of a good quality 3rd party dye ink. IMHO with HP and Canon printers if you want to use pigment inks buy a pigment ink printer. demoeb, videobruce, palombian and 1 other person like this. I'm familiar with various ink technologies and the printer head systems. What I'm really looking for is someone whose tried what I'm looking at and either had success or failure. With the HP T120 the cost of failure is slight since a new print head costs just over US $200. What intrigues me is that the head already handles black pigment ink in one of the channels - dye color in the other three. @ccc, For me, I reckoned @Ricardo Quindere gave you the answer you were looking for without going into too much technical details, but obvious it seems it wasn’t enough. Here is a Pic of a standard Canon Dye print head, it has a set of small Dye nozzles and one single large Pigment nozzle, note the difference in nozzle size.. This is a Pic of a standard Canon Pigment print head, and the nozzle sets are all the same size, (No small nozzles needed), without saying more, can you now see why pigment ink won’t work successfully in a Dye print head. P.S. Canon dye ink cartridges will not function properly using pigment ink either..
@ccc For the first part of your questioning I feel I can not help you, because I never wanted to take the risk of using pigmented inks on thermal printers designed for use with dye-based inks. As you say that for the HP T120, the cost of the damage is small, perhaps it is up to you to assess whether you should risk and conduct your own tests. And please posting the results here to enriching the content of this forum. As for the second part, about how the head deals with black pigmented ink in one of the channels and dye in the other three. I can give you a hand, complemented what @The Hat posted. I have an Officejet 7500A (print up to A3), which as your large format, also uses pigmented black ink and MGY dye-based inks. The answer is simple. HP uses two discreet nozzles set, one with only one channel for the black color and other one with triple channel to manage the other three colors (MCY). The figure below shows how the ink get into the print head through individual ink drawing holes for each ink color. Notice how the black pigment ink pickup hole is much larger than the other three holes dedicated to dye-based inks. the ink gets out the print head and goes to the paper. one core question is not answered yet - is there any suitable pigment ink available in place of the dye inks - a refill offering ink by some company or ink suitable for thermal printing from another HP printer using pigment inks. Printer using a pigment black only typically use a much wider nozzle row, with many more nozzles than the individual color channels, and they use a bigger droplet size as well, this all to print much faster , to get enough black ink onto the paper in a single pass of the printhead. @Ink stained Fingers I have two printers in use. An HP 7500A that uses pigmented ink for color black and dye ink for MCY colors. Use it for general printings such as documents, drafts, graphics, general tests, etc. My other printer is a Canon Pro-100 that uses only dye inks. This I use it just for photos. Canon has a printer quite similar to this one that uses pigmented inks, is the Canon Pro-10. All three printers use thermal technology. 1. 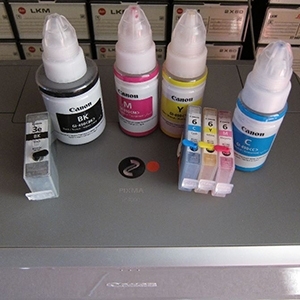 For MCY inks, I am refilling cartridges with Canon Pro-100's 3rd party Precision Colors inks, specifically the PC-42M2 (Magenta), PC-42C (Cyan) and PC-42Y (Yellow) inks. The inks I already using in my Canon Pro-100, so I have only one set of MCY inks. 2. For black ink I am also recharging the cartridge with 3rd party inks from Precison Colors, however from the Canon Pro-10, more specifically PC-72SE-PK from the Signature Edition line, that is a pigmented ink. So I have to pay attention when refilling the black cartridges, because I have 2 types of black inks. So far I'm satisfied and I had no problems yet, but still in a short period of time to assure anything about efficiency and longevity, only 2 months. But you see, I use pigmented ink only in black color, which is what HP was designed for. In other colors I keep using the dye inks. Here is my suggestion for anyone who wants to take the risk to try to use pigmented inks in thermal dye ink printers. Use the inks developed to Canon Pro-10, a thermal pigmented ink printer. However, as I said before, I do not feel comfortable in thermal printers designed for dye-based inks to replace them with pigmented inks. So it is all just about black ink - dye or pigment in your printer ?